Dave Kehl Chevrolet, Inc., has been the number one Silverado truck dealership in Ohio for the past two years running. In addition to a high volume sales department, they also have an extensive parts and service department, which recently moved to a new facility across the street. The original service department housed narrow shelving with only 24″ wide aisles, which was difficult to access and maneuver around aisles. In addition, the number of parts needed for service was steadily increasing. They were in dire need of a smarter storage solution. 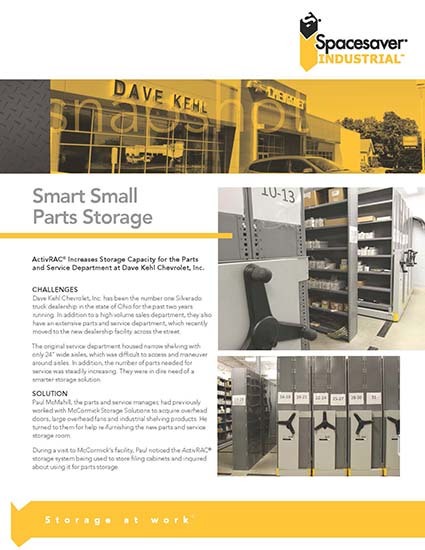 Learn how Dave Kehl Chevrolet was able to store 3Xs the amount of parts in the existing shelving units with the help of ActivRAC Mobile Storage System.